There are a number of ways that scientists look at the planet Earth. 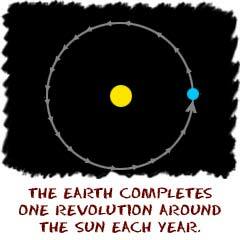 The Earth makes one revolution around the Sun. It actually takes about 365 and one-quarter days to revolve around the Sun. To keep our calendars straight, we take four quarter days and make February 29. That extra day only happens on leap years. We measure the time it takes to make one revolution by counting from solstice to solstice. The two big soltices are summer (June) and winter (December). The summer solstice is the longest day of the year for the Northern Hemisphere. Winter has the shortest day of the year for the northern hemisphere. While the total energy reaching the Earth is the same throughout the year, it is distributed differently during the different seasons. When you watch a basketball player spin a ball on his finger, you are seeing the ball spin around its axis. The Earth spins too, but not up and down like that ball. Its axis is on a tilt. The tilt is 23 and one half degrees from the center. 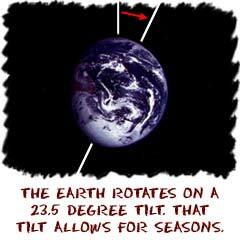 That tilt lets the Earth have seasons and changes in the day length. Longer days mean more incoming energy. A long day in the northern hemisphere means more energy in the north. but also less energy in the southern hemisphere. The rotation of the Earth is the actual spin of the planet. 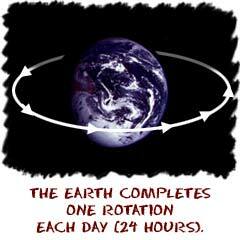 One rotation of the Earth is one spin. That spin takes about 24 hours (a day). The Earth spins around its axis and if you looked at the planet from the side, it would be spinning from left to right. When you are looking down on the North Pole, it's moving in a counter-clockwise direction. It doesn't matter to the Earth, but one side of the planet is always receiving more energy than the other. We suppose that makes sense. One side of the planet faces the Sun and receives the incoming energy. It's not a lot, but when you see the Moon at night, you should remember that small amounts of EM radiation are reflected back at the Earth (mainly visible light). Alignment is the way the Earth is tilted compared to the Sun. Obviously we have seasons. We have seasons because there are times of the year when the southern part of the Earth is closer to the Sun and times when the northern part is closer. When the northern part of the planet faces the Sun there is a greater overall buildup of energy in the north. Temperatures increase and because of longer days, there is less time for the energy to dissipate. The energy is also greater because the Sun is higher in the sky. There is less chance for the energy to reflect off the surface or the atmosphere. The energy hits the surface at a 90-degree angle and the builds up. All of these small factors add up to create a world where temperatures are hotter one-half of the year and cooler during the other half.